You should now know the key terms you need to start learning the beginner strategy. The first step is determining the overall market direction, which is the base for making the rest of your trading decisions. Switch to the 30 minute time frame (M30). The image to the right shows a fractal. A fractal is a small triangle that is either plotted above or below a Japanese candlestick. 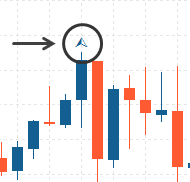 When a fractal is plotted above a Japanese candlestick it is an up fractal and when it is plotted below a Japanese candlestick it is a down fractal. You will use fractals throughout the beginner strategy, however it is very important to know that you should wait for two candles to close on the right side of the fractal to confirm that the fractal is valid. Until this has happened, completely ignore the fractal. An up fractal breaks if a candle to the right of it has gone higher than the high price of the candle below that fractal. 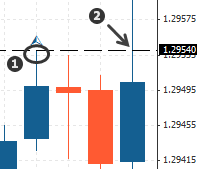 A down fractal breaks if a candle to the right of it has gone lower than the low price of the candle above that fractal. Note: it is the immediate break of the high or low price of the candle at the fractal, not the fractal itself, that gives the indication. In the image to the right, you can see that it is the high price below the fractal at 1 that is broken by the candle to the right at 2. In order to determine the market direction, find the last broken up fractal and the last broken down fractal. Determine which of these two fractals broke last. If the up fractal broke last, the market direction is up. If the down fractal broke last, the market direction is down. You can see that there is a down fractal, shown as 1 that has been broken. The break of this fractal is shown as 2 – this is the break-point of the fractal. However, the last fractal to be broken is the up fractal shown as 3, the break-point of this fractal is shown as 4. This is the last break to happen of a fractal and because this fractal is an up fractal, the market direction is up. Whichever fractal broke last will be the market direction. So if the last break point was of an up fractal then the direction is up and vice versa.